The Darby personal fan features a whisper-quiet 20-watt motor and you can take it anyplace you go, directing the airflow to make you most comfortable. Get ready to be blown away! 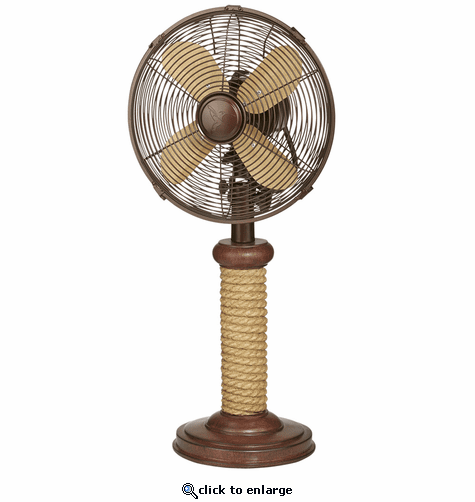 This rustic fan makes even the hottest summer days more tolerable,so you'll quickly become a big aficionado. The DecoBreeze portable fan collection was conceived from inspiration in decorating our own homes. Our families, like millions of others wanted air circulation in our houses but ordinary stand alone fans were just too much of an eyesore! A revolutionary breakthrough, DecoBreeze transforms the stand alone fan into an ultra stylish home d?cor accent. We are proud to offer you amazingly high quality fans that fuse function and design.